We offer full service catering for groups of all sizes, pick up, delivery or have out team take care of your whole evening so you can sit back relax and enjoy. Chula is a lively Taberna Mexicana with amazing selection of tequila, mezcal, beer and cocktails that complement flavorful delicious food. 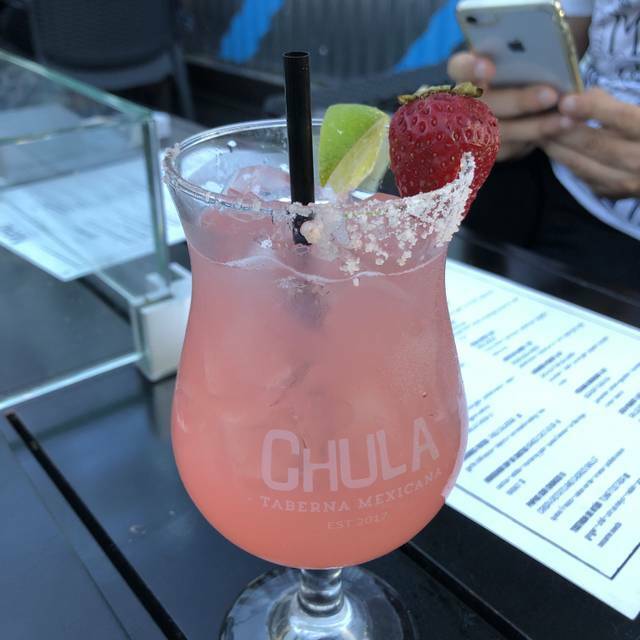 Chula is a two-story space with 2 outdoor patios & 3 tequila bars, equipped for large parties & private events that offers authentic cuisine inspired by traditional & modern Mexican cantinas. Saturday and Sunday brunch service until 3pm. Really great experience! Food was delicious especially the cactus dip! Food was sub par. Underseasoned and overly wet, and wet tacos are not a win. Some of the greatest Mexican in the city! 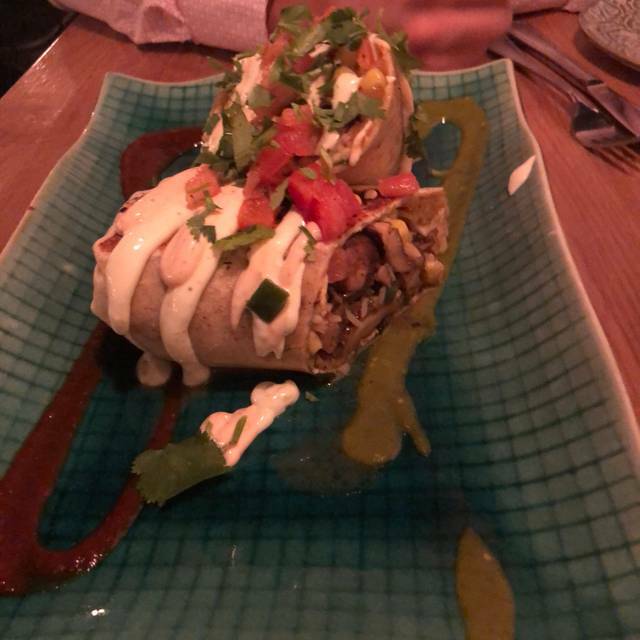 The tacos are AMAZING! Great service with a smile , great food ,great ambience! The cactus dip is to die for ! We thoroughly enjoyed it.we will definitely go back ! The food was good, but a little pricey for what you get. Most of the tacos have a mayonnaise type sauce on them so not a fan. The restaurant was tight, with too many tables crammed in. I felt like we were sitting on top of the people at both tables on either side. Service wasn’t the greatest, though I don’t think it’s a problem for the entire restaurant just the server we had. Service is ALWAYS great. Food is delicious and the drinks are fantastic. Great spot to go on a date, meet with friends and hang out. Patio is great during the summer. Came with a large group and had a great time. The food is always fantastic and the service is awesome. Food was quite tasty. 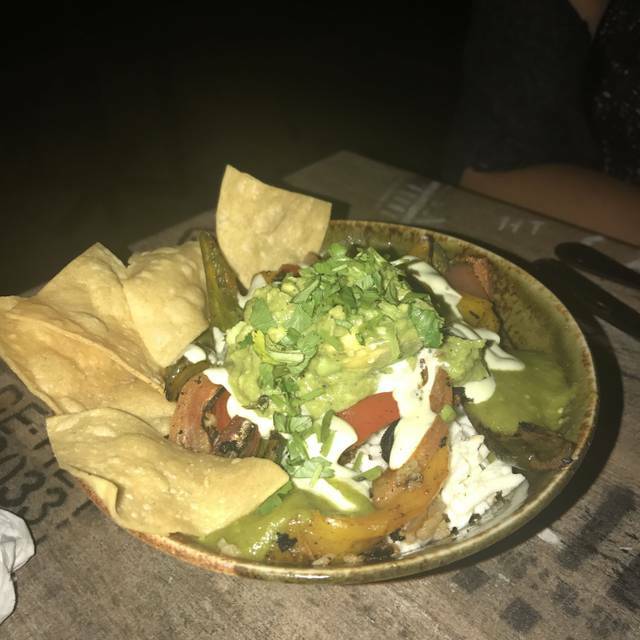 We had the tortilla chip and dip trio - the chip to dip ratio was low but waitstaff did bring a small bowl of extra chips. Shrimp tacos were very tasty - a bit difficult to eat again a bit small to hold the shrimp and condiments. I would highly recommend this restaurant. Amazing restaurant with excellent food and great vibe!! Will definitely go back again! Good vegetarian updates to the menu! There should be a sides section that lists beans and rice and Mexican cuisine ingredients such as jalapeños, queso, cilantro lime, cactus et cetera. Amazing food! Had brunch there and the spice level was just enough for me to enjoy the flavours without feeling like I needed to put out a fire in my mouth. Their spicy ketchup is so good. I highly recommend the chula Benedict. The noise level was not crazy but we were in the booth by the bar not in the back of the restaurant. This was our first time going there and I had requested a nice seating when I booked the reservation. When we went there, they just asked us to sit anywhere, didn’t seem like they even took our request. 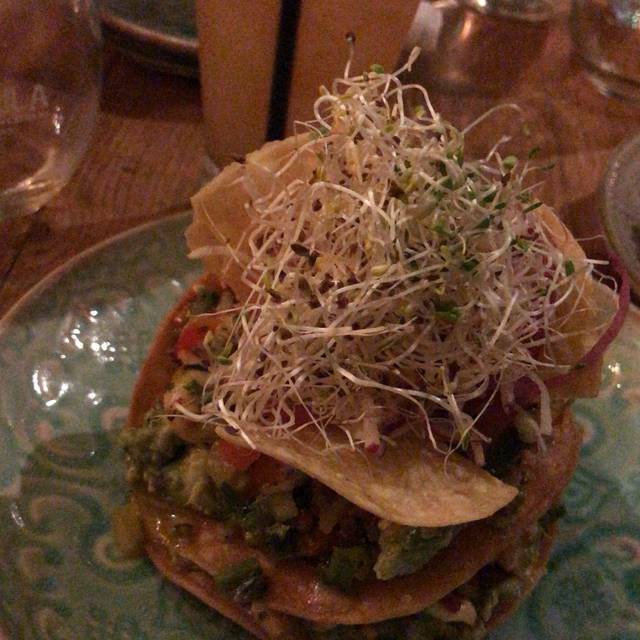 Food was OK. Have had better tasting guacamole. Drinks was ok as well. My husband ordered a cocktail and it was sweet instead of being Smokey. The art work was very nice. Service was alright. Overall an OK place. Not sure if I’d go there anytime soon. Food is amazing. Drinks are creative, but not cheap. Atmosphere is active. We were in a booth so able to have a conversation relatively easily, but at a table I would suspect it would be more difficult to hear the other person speak. Great upbeat environment - Server gave good recommendations, food was great, we were well looked after. Loud atmosphere, but not so loud that you couldn't have a conversation. Fun night!!! I had such a fun night and amazing food! My friend and I slit a number of dishes as everything is amazing! Fried calamari with a spicy chili sauce, tacos: beef brisket, pork shoulder, chicken, battered haddock, each one with a unique set of toppings that just amps up the already succulent flavours. Amazing menu especially for sharing. We also sipped on (multiple) classic margaritas. I love Chula! It’s my Mexican heaven in East York! All the food ordered was loved by the table. Very noisy and crowded. Service was average. Great time, food, atmosphere and service. We’re definitely going back! Chips and guacamole and salsa are good and nice price point. 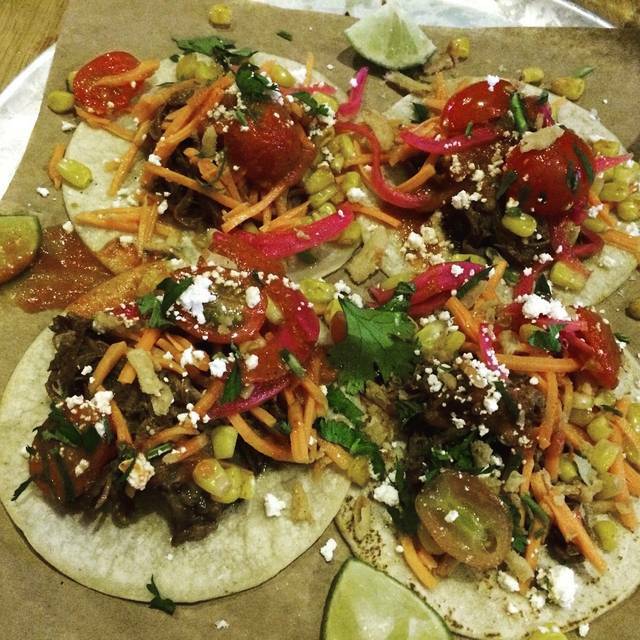 Tacos are so overstuffed you need to use a knife and fork. Butterflied shrimp tacos did not have butterflied shrimp. Weak margaritas, nice server. We went for Valentine’s Day. They had a great deal for unlimited tacos for the night. Very good! 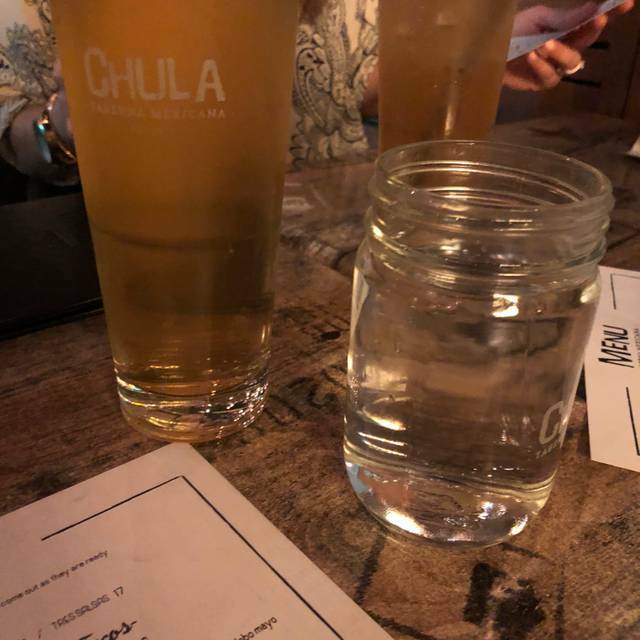 We choose Chula as our go to spot for special occasions - not because we wouldn't love to go there regularly, but we find ourselves spending so much that we can only go once in a while. Everything is so good that we can't decide what to get - so we get everything! The fixed price menus are a great value and they allow for the trying of their excellent appetizers and cocktails. That mango habanero margarita is a nectar of the gods! Highly recommend!! 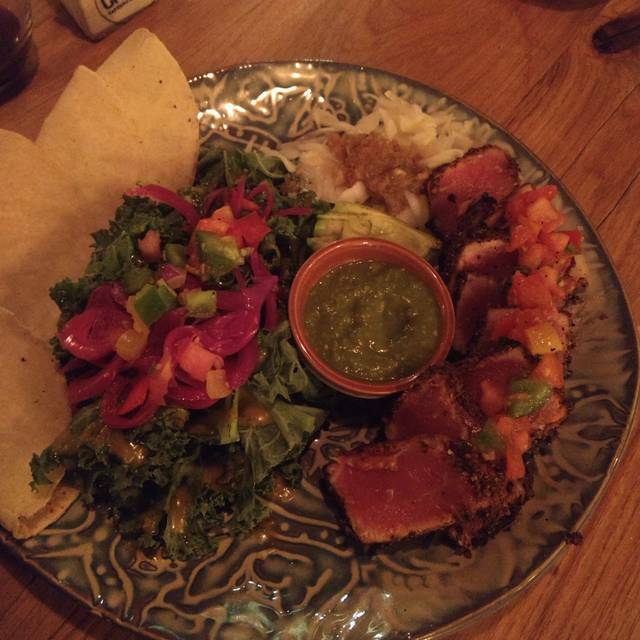 You can't go wrong with Mexican food, but Chula is still able to stand out. It's our go-to restaurant for special occasions. The neighbourhood is low key. It is easy to find street parking. Inside, the restaurant has a festive, and energetic ambiance. Their drinks menu, especially their signature cocktails, are fun, creative, and enjoyable. 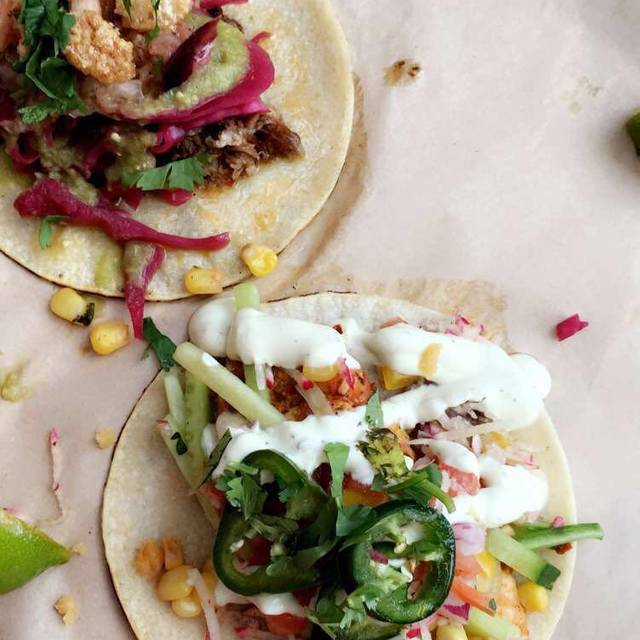 Their selection of tacos offers enough variety that can be easily sampled with their moderate prices. Service is also fast. I just hate their washrooms. If you’re seated upstairs ask for a low table - the high chairs are ridiculously uncomfortable, slippery and small. 3 tacos will set you back about 15 bucks average - not the most outrageous price but not lux enough or authentic enough to merit the price. Decent margarita, nothing to write home about and sub par guacamole. All said and done not my favourite way to blow through 90 dollars for a 2. Delicious and unique brunch menu without the lineups. The food was amazing but the noise level on weekend nights is almost too loud to handle. Love this place!! The food is ALWAYS on point! Staff are friendly and fast! The food was amazing but I felt like I was in a cafeteria a bit. The lighting could have been more dim and candles would have been ideal. My friend and I were having dinner on a Wednesday evening with people still in the restaurant. It wasn't that busy but the staff were set on cleaning up the place with gathering sauces from the tables and getting ready for close. Kind of made us want to leave sooner than planned. Great food, large portions, but could be mas picante. 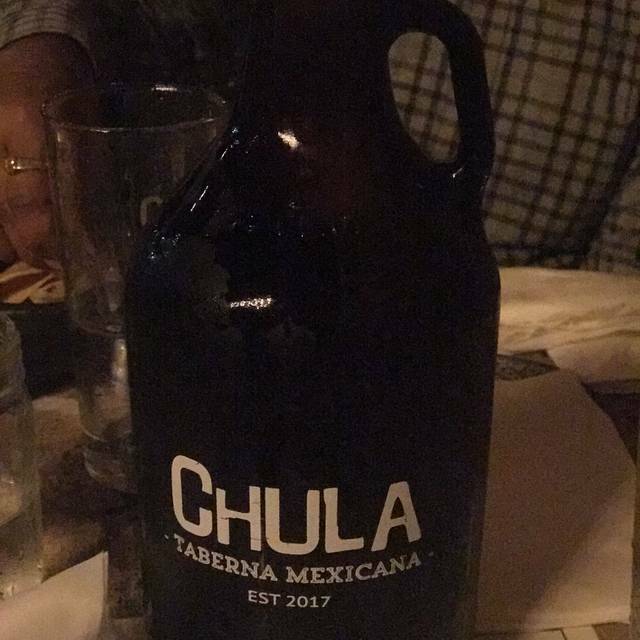 This was our second visit to Chula, and it was as good this time as last. Terrific food, great drinks, and a really fun atmosphere. Ceviche was really REALLY good, so if you go, order it. Great food and drinks. Awesome margaritas. A bit loud and sort of surprising on a Wednesday evening. The tables were really squashed in. People had to stand up to let someone at another table out. Taking a few tables out might really help with the ambiance. It was also really loud. Food was delicious though; would absolutely come back! Been here many times and it is always consistently great, authentic Mexican flavour. Also a large selection of tequila for sipping! Last minute change of plans on New Year’s Eve. Our table was tucked away but suited my partner fine. Our server disappeared and the bartender took over, but service was very efficient. Would definitely visit again. Food was really nice and not too pricey. Had a good selection of beers and extensive tequila list. If you are into that. Fried zucchini taco was delish. Sat at a high table and the light was kinda blinding so would suggest a table that isn’t raised. All in all a very nice experience.